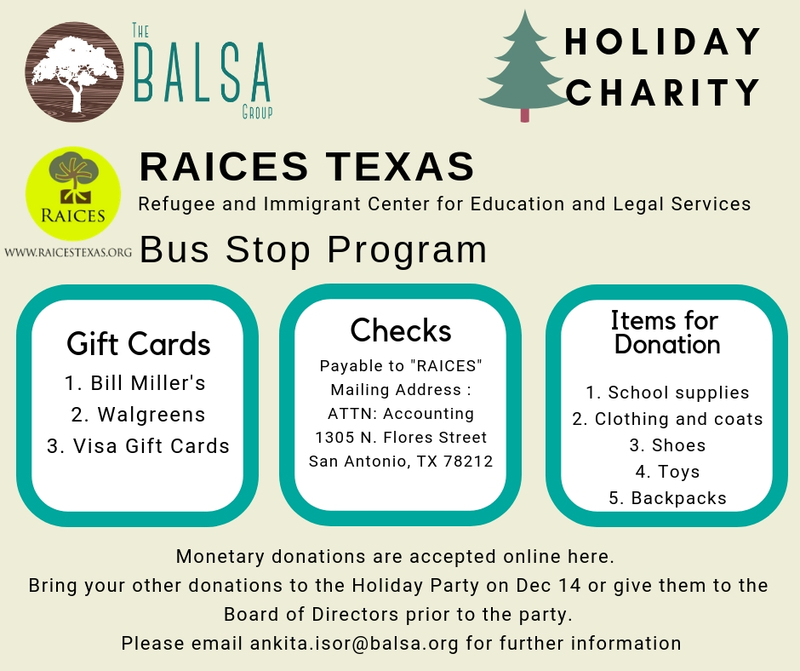 This year's holiday philanthropy will benefit the Bus Stop Program at Refugee and Immigrant Center for Education and Legal Services (RAICES, Texas). In this program, a RAICES staff member and team of volunteers go to the San Antonio Greyhound station to assist recently released individuals and families. The BALSA Group will match all monetary donations, which can be done online when you RSVP for our Holiday Party. Donations can be in form of cash, gift cards or checks. Checks should be payable to "RAICES". Please find any of the officers at the party to hand over your checks, gift cards and cash donations. Click here to know more about mail donations and gift cards. Click here to donate when you RSVP for the Holiday Party.